Butter cake soaked with a mixture of cream of coconut, sweetened condensed milk and whole milk. OK, we all know how obsessed I am with coconut. And for those of you out there that hate it, well... I really hope we can still be friends! I asked a coworker of mine if he liked coconut one day (because I'd brought in one of those Italian Bakeless Cakes) and he told me he'd rather pick up a handful of gravel out of the yard and eat that. WELL! I'm kinda noticing that about coconut.... you either like it or you don't. There's no gray area. Well, for those of you who do like coconut, this is one of my very favorite coconut recipes! The name means, "Three Milks Cake" and it comes from soaking the cake with a mixture of three types of milk. In my version, I use cream of coconut, sweetened condensed milk and whole milk. Make cake per directions for a 13x9 cake. Leave cake in pan and let it cool completely. Once cake has cooled, poke holes all over cake using a wide-tined fork or skewer (you need about 60-70 perforations). Mix cream of coconut, sweetened condensed milk and whole milk with an electric mixer until smooth. Pour milk mixture slowly and evenly all over cake. Cover cake and refrigerate at least four hours to allow cake to soak up milk mixture then spread evenly with cool whip and top with coconut. Refrigerate cake until ready to serve. *Substitute up to 1/2 of the whole milk with spiced rum or regular rum if desired. 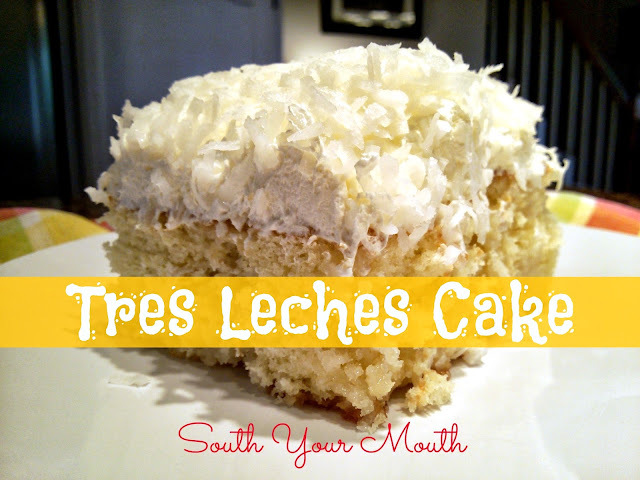 I love Tres Leches, but have only ever eaten a made from scratch one. Have made a couple of them from scratch, not to much work and totally worth it. Tres Leches Cake is my favorite! I make a coconut tres leches very similar to yours with some tweaks you might want to try if you really want to highlight the coconut. I use coconut milk in the batter in place of the water(this is in addition to the can you mix up with the other milks.) I also add some coconut extract to the batter. For the milks, I prefer to use evaporated milk or fat-free half-n-half instead of whole and I pour it in while the cake is still warm and let it cool completely. And please, please, please(!!!) toast the coconut for the top; it will change your life. Have made Tres Leches Cake before but never with the coconut frosting/topping.............can't wait to try your recipe!! Sounds absolutely delicious. Thanks. Thanks, girl!!! We coconut sistas got to stick together!! I love coconut recipes! And this cake is something I would love to have a taste. I really like that it's made of different kinds of milk. I love everything about it! i have made this cake at least a dozen times. It is the all time favorite of all my friends. I make it for bake sale auctions and it always sells for $40 or more. It is amazing and yes I do use Capt Morgan rum!